This picture was consolidated over the following decades as "Netherlandicizing" currents increasingly gained ground across Europe. In the 1440s, Barthelemy d'Eyck (doc. from 1444— c. 1476) produced his famous Annunciation triptych for Aix cathedral, while in Naples Colantonio (doc. 1440—1465) made the new style his own. In Barcelona, Lluis Dalmau (doc. c. 1428—1461) set about painting, in his 1444/45 Virgin of the Councillors for Barcelona's town hall, one of the most faithful imitations of a van Eyck anywhere to be found. In Cologne, the most densely populated city in Germany, Stefan Lochner combined Eyck formulae with clear reminiscences of the Soft Style: the hems of the robes in his Virgin of the Rose Garden undulate like waves. Particularly striking here, as in his Darmstadt Presentation in the Temple, are the delicate, extraordinarily sophisticated harmonies of his palette. In the retrograde handling of scale in their figures, however, both panels lag far behind the van Eyck. Pasty, doll-like faces, overly large gold haloes and gilt grounds embossed with ornate decoration complete the picture. 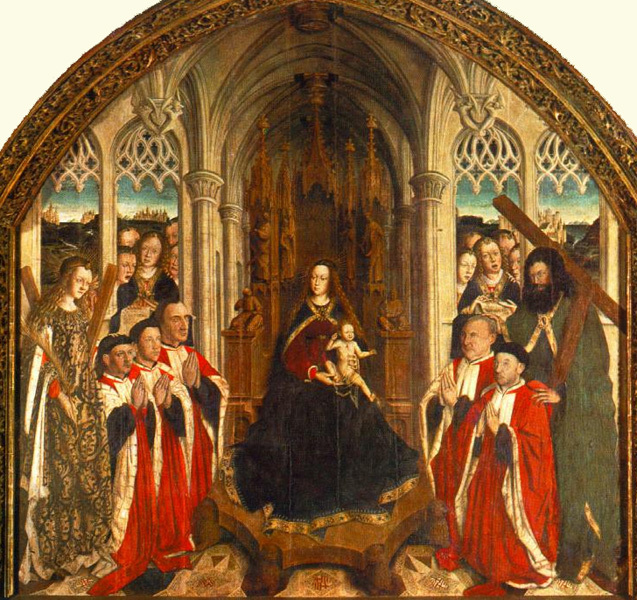 That Lochner was nevertheless very familiar with developments in the Netherlands can be seen from the Patron Saints of Cologne altarpiece which he painted for the chapel in Cologne town hall, and which is today housed in Cologne cathedral. The folds here are far more angular than those of the Virgin of the Rose Garden executed a few years later. The Annunciation on the altar's exterior recalls the Ghent Altar even at the level of individual motifs in the Virgin's spreading draperies. In continuing to deploy elements from the past, however, Lochner was not betraying his incompetence, but was very consciously playing with the motifs and formal canons of different styles and regions - an "un-Gothic", extremely modern approach for which in the 15th century, significantly, parallels existed only in Italy. That we are dealing not with some inferior imitator, but rather with one of the most important Late Gothic artists of all, is surely demonstrated best of all by the fame which he enjoyed for generations to come. His design solutions and nature studies were drawn upon by Schongauer, himself a master of composition, and even Rogier van der Weyden, at that point the most important representative of the Early Netherlandish school. Over half a century after Lochner's death, Albrecht Durer went to the chapel in Cologne town hall in order to admire for himself the masterpiece which still survives today. It was precisely the freedom with which Lochner created his art that ensured he would remain an isolated phenomenon, however famous. 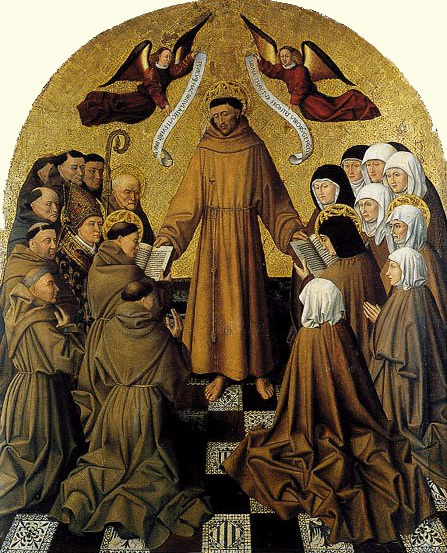 The Cologne painters of the following decades (Master of the Life of the Virgin, Master of the St. Bartholomew Altar) would orientate themselves towards their Netherlandish contemporaries, in the first instance primarily towards Rogier's "successor", Dieric Bouts (c. 1410/20 —1475). Their borrowings were thereby restricted to selected figural, drapery and landscape forms. Their approach to composition and their techniques of preliminary drawing and execution remained entrenched in local tradition — not just with regards to such obvious features as gold grounds and nimbuses. A constant "updating" of forms derived from the Netherlands can be observed in other European regions, too. The latest trends in Bruges and Antwerp were still being adopted even in distant Portugal right up to the early years of the 16th century. (b ?Naples, c. ?1420; d Naples, after 1460). Italian painter. A certain ‘Cola de Neapoli’ is documented in Rome in 1444, but he cannot be definitely identifed with Colantonio. The main source for the reconstruction of Colantonio’s activity is Pietro Summonte’s letter of 1524 to the Venetian Marcantonio Michiel on the history of the arts in the Kingdom of Naples. 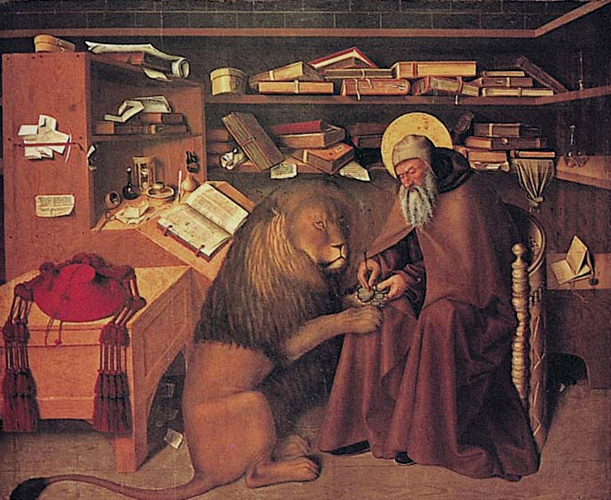 Despite the small number of undisputed works, scholars unanimously assign to Colantonio a primary role in the history of Neapolitan painting in the period of Aragonese rule between 1440 and 1470. In those years Naples was the capital of a vast realm and a centre of culture and art where many international styles came together. The earliest reference to him is in 1428, when he is called ‘painter of the city of Valencia’ and is mentioned as being in the service of Alfonso V, King of Aragon. Dalmau remained in Alfonso’s service for at least nine years, at times serving in a diplomatic capacity: he was sent to Castile in 1428, and in 1431 to the south Netherlands, although the duration and purpose of the latter visit are unknown. No works done for the King are known, and the only royal payment made to him was for some minor architectural work.